The Herald Journal broke news earlier today that the UC Santa Barbara Gauchos will be making their second trip to the Spectrum as a part of the ESPN BracketBusters event on February 18. The Gauchos played in Logan in the 2008 event. This isn’t the first repeat opponent for Utah State, who faced St. Mary’s in 2011 and 2009. The Dee Glen Smith Spectrum has always been considered one of the very best college basketball atmospheres in the country, but how does it compare to other renowned venues? 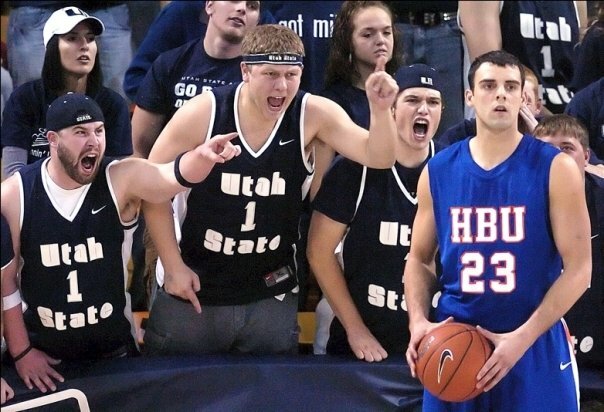 A few weeks ago I wrote an article asking if the Utah State Student Section was #1 in the nation. We’ve heard coaches like Rick Majerus (St. Louis, and former Utah coach) and Greg Marshall compare us favorably to schools like Kentucky, Syracuse, Uconn, Indiana, and Duke, but was it all just lip service? How would I ever know unless I had first hand experience? Living on the east coast has given me the opportunity to attend many sporting events that I otherwise would not have been able to attend. I’ve been to a couple George Mason games, a couple Georgetown games, and also a George Washington game. A couple of years ago I drove down to North Carolina to attend a rock concert, and took advantage of the opportunity to visit one of the meccas of college basketball, Cameron Indoor Stadium. Walking through the deserted Stadium I could sense the history and amazing atmosphere even with no fans present. This winter season I decided that my Christmas Present to myself would be another trip to Durham, North Carolina to attend a basketball game at Cameron Indoor. Acquiring tickets is no easy task. Getting in the doors required use of StubHub and some serious cash, but it was well worth it. I attended the Duke vs. Virginia game on Jan 12, 2012 and wasn’t disappointed. The thing that stood out to me most about the Cameron Crazies was coordination in their chants. Not so much just with everyone chanting in unison, but the fact that everyone is also doing hand motions or dancing in unison as well. This makes the chants seem much more united and look very cool from a distance. Even simple chants like “Let’s go DUKE!” involve a hand motion (fist-pump on DUKE) that seems to bring the crowd together and create a fun atmosphere. The crowd sang along to the pre-game music selections and even had coordinated dances to many of them. When Coach K walked in, everyone gave him the universal worshiping motion. All of the students in attendance were totally involved in all of the chants, dances, and hand motions from before the tip-off to the end of the game. Coordination is also a strength for The HURD, but in a different way. While the Crazies have the edge in hand motions, and traditional dances to their chants and songs, the HURD has the edge in overall fan coordination. The Refraction has played a major part in recent years in bringing everyone on the same page, but even after the Refraction crew hung up their sneakers, the HURD has shown an amazing ability to coordinate. After an infamous apology letter and rogue usher mix-up, the entire Utah State Student section remained silent for the first few minutes of a game against Denver earlier this year. It took the students no more than five minutes to spread the word through a stadium full of nearly 4,000 students, and not one of them made a peep until the token silence was over with. Was it a good idea? Maybe, maybe not, but the coordination was definitely there. The HURD is also famous for their “I Believe That We Will Win“, and “Winning Team, Losing Team” chants, as well as their hand motions on the rousing favorite “The Scotsman”. 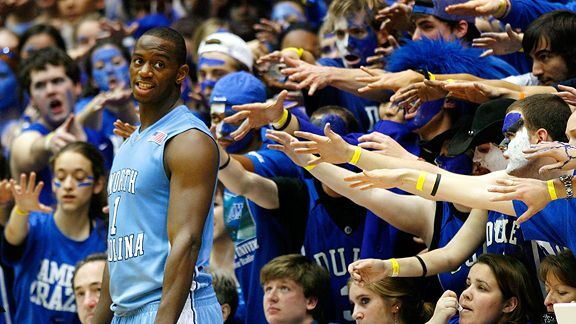 Advantage: Slight edge to the Cameron Crazies. The hand-motions on all their chants were just that cool. The Spectrum would look amazing if they could adopt this aspect, and it would keep the students more involved and united. Walking in to Cameron Indoor Stadium was a completely different atmosphere from what is felt as the Dee Glen Smith Spectrum. It was a FUN atmosphere. The students arrived early with faces painted, hair crazily styled, and dressed up in a wide array of crazy outfits. It was like a huge party between a group of tightly knitted friends. The crowd happily cheered on their players and coaches throughout the game, and made some pretty good noise when things were going right. There is the signature “spell casting” that is put on the opponents throughout the game. But this also seemed more like fun than intimidation to me. The Dee Glen Smith Spectrum is a much more intimidating environment than the Cameron Indoor Stadium. It’s as simple as that. The first thing that the opposing team hears (or sees, in some special instances) is “Welcome to HELL!” before tip-off. And that’s exactly what they can expect the entire game. The Students come prepared with all sorts of ammunition to hurl at the opposing team. There have been multiple instances where opposing players have literally been brought to tears on the bench during the games from the relentless taunting and heckling shown to them. If you are an opponent with skeletons in the closet, fully expect to have them brought out into full view during the game. The HURD has contributed to some complete meltdowns of all-league players. The “Who’s Your Daddy” and “Ugly Duckling” chants to NBA-bound Coby Karl immediately come to mind, causing him to miss two straight potentially game clinching free-throws despite being one of the WAC leaders in free throw percentage (83.5%) that year. The noise level in the Spectrum also definitely contributes to the intimidation factor, but we’ll get to that momentarily. Advantage: The HURD, and it’s not even close. If the Cameron Crazies are crazy, the HURD is flat out insane. This was one of the things I was most curious about. The Wikipedia entry for Cameron Indoor Stadium boasts noise levels of 123.1 dB, similar to a power saw at 3′ or a jackhammer. Just how loud would it get in Cameron Indoor Arena? Luckily I was able to witness a good game pitting two Top-25 ACC opponents against each other in a game that was highly contested, and came down to the final shot. While I doubt that this game would compare to the Duke vs. UNC games, I think it’s pretty safe to say that it should have been one of the louder games at Cameron Indoor. The noise level was pretty tame for the first half of the game. There were a few peaks in the second half that got pretty spirited, but nothing even close to what I have heard in the Spectrum. Still it was probably the second loudest college basketball venue I have attended. One disappointing aspect of the noise at Cameron Indoor was the fake decibel meter that they showed from time to time on the scoreboard. I absolutely hate those things. It’s a video sequence showing a decibel meter going up higher and higher and finally topping out at insane levels. The Duke crowd got loud for it and then quieted down before the thing even topped out. It just kept going up and up despite relative silence in the crowd. That just insults a crowd’s intelligence in my opinion. I will say that the alumni section at Cameron Indoor puts the Utah State alumni section to shame. They were fairly loud and spirited and participated better than the Aggie alumni do. The noise levels in the Spectrum are second to none. I have never heard anything as loud as the Chaz Spicer three-point game-winner over Utah in 2006. The noise that ensued after that shot was so loud that my ear-drums actually gave out and the noise finally blended into an eerily silent white noise for a series of about 15 seconds. I’ve been to my fair share of rock concerts and other types of sporting events, and nothing has ever even come close to that kind of noise. Another extremely loud moment happened in 2009 in a game against the Nevada Wolfpack. Stavon Williams and Brady Jardine took over the game on a huge Utah State run as Mark Fox refused to call a timeout after stating in the pre-game that he didn’t believe The Spectrum crowd had an affect on the game. Can you hear us now Mark? I truly believe that I have suffered permanent hearing loss from attending so many games in The Spectrum. I was happy to see that they are now distributing ear-plugs to the fans for the big games in the Spectrum. I’ve also heard that there have been talks of posting warning signs as you enter The Spectrum explaining the potentially damaging affects of the noise found therein. If The Spectrum Alumni could contribute as much as the Cameron Indoor alumni do, the Spectrum would be even better. The Spectrum: eardrums enter at their own risk. As mentioned above, the Cameron Crazies are definitely fun. If you want to party with your friends, dress up, and act crazy, Cameron Indoor is for you. The atmosphere was very upbeat. Lots of cheering for your team, and very little intimidation towards the opposing team. Apparently this is something that Coach K preaches to the crowd. There are definitely plenty of fun times to be had at the Spectrum, but often times they are at the expense of the opposing player or coach. In 2007, the HURD found a suggestive image of a greased up New Mexico State coach Reggie Theus. When Reggie came to town he was met with hundreds of color posters, and a group of front row diehards even participated in a Reggie Theus lookalike contest. The HURD can laugh at themselves as well as their opponents, as can be seen by the Stew Morrill Lookalike contest that happened later that same year. The Cameron Crazies have been well known for their creativity. From “Speedo Guy“, to the “spell castings” and creative outfits. I saw a Storm Trooper, Banana Suit, full body spandex suits, and plenty of crazy wigs. What I most looked forward to were witty chants. In this aspect I was pretty disappointed. There were no spur of the moment witty chants at the game. My favorite chant was “Crazy Towel Guy” that they chanted during a timeout in the second half until this crazy guy in the alumni section stood up and waved his towel around. But apparently this was not a creative, spur-of-the moment chant, but a traditional chant done at every game. There were very few signs at the game despite it being nationally televised. The only sign that I saw directed at other players was something to the effect of: “Who are your players again?”. Not creative. The layout in Cameron Indoor is very unique. About 80% of the lower bowl (which consists of pull-out bleachers) is dedicated to student seating. The student section wraps around most of the arena, and the students seats are pretty close to the court. The court-side students are within reach of the players as they pass the ball in if they reach over press row. The students are fairly close behind the hoops as well, but there are 2-3 rows of alumni seats in front of them that provides somewhat of a buffer. The stadium was designed for a maximum of 1,100 students, but the students have been known to cram in upwards of 1,600 for high profile games. The Dee Glen Smith Spectrum was built with the help of student fees, and has dedicated a large portion of its seats to students since it’s opening in 1970. The Spectrum holds around 4,000 students spanning close to half of the arena. The students sit behind the hoop on one side, and occupy most of the court-side seats opposite the team benches. The sheer number of students attending the games makes for a very intense and loud atmosphere. Like the Cameron Crazies, the HURD stands up the entire game, and the seats go right down to the court. The only difference is that there is no press row in front of the court-side seats, and the only thing between the Bull-Pen (Section F behind the hoop) and the court is a railing barrier. This helps the students have “friendly” conversations with opposing coaches, players, and referees. The Crazies have a very nice layout, giving the majority of the seats closest to the floor to the students. The HURD has the advantage in size with nearly 4 times as many student seats. Walking into Cameron Indoor arena was like stepping back in time several decades. The stadium, built in 1940 doesn’t look like a basketball arena at all from the outside. Air conditioning wasn’t even installed until recent years. The concourse has amazing inlaid duke logos, trophy cases, huge posters, photos, and a nearly never-ending display of history and tradition. Looking into the rafters reveals an insane amount of championship banners, some of which are also seen in the concourse. There is also a sports hall of fame that can be accessed from the concourse level. The Cameron Crazies also populate Krzyzewskiville each year prior to the North Carolina game and other select “tenting” games. The Dee Glen Smith Spectrum was built in 1970, and sports traditional 70’s style fall-colored seating. 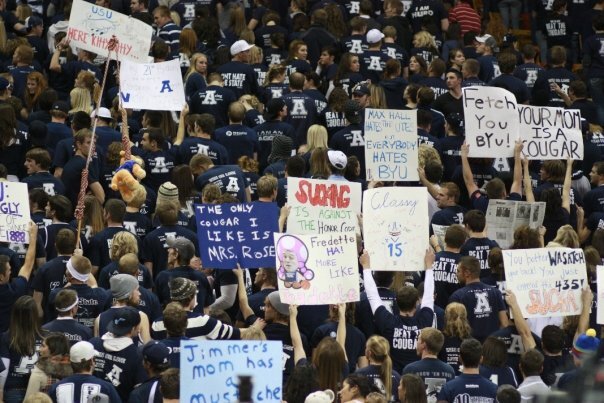 It has always had a great tradition of student and alumni support, but we here at USUStats.com believe that this has increased over the last decade or so. Many students wait in line for a minimum of 12 hours to obtain good seats to every game. 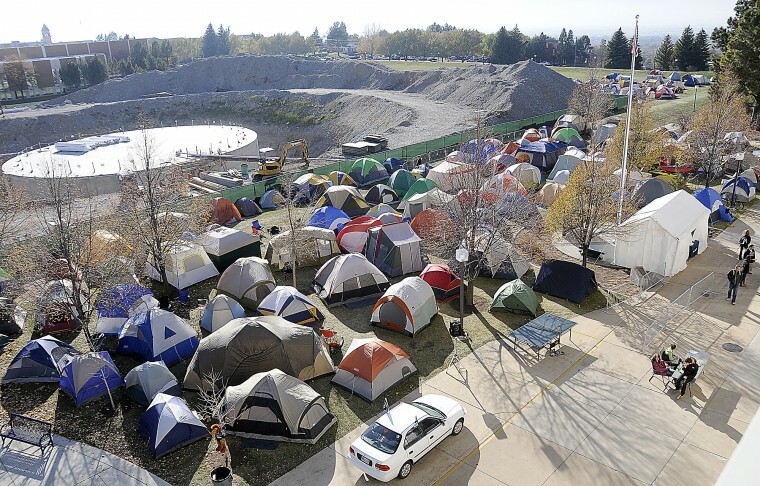 The HURD has also instituted their own version of Krzyzewskiville in recent years before the in-state rivalry game against BYU. There is some good basketball history at Utah State as can be seen in the trophy cases and hanging banners, but it does not quite live up to the achievements at Duke. So, which environment is the best for college basketball games? I guess that depends on your preferences. If you value costumes, dancing, fun, and tradition, Cameron Indoor is the place for you. If you value creativity, coordination, intensity, intimidation, and sheer noise, the Spectrum is the place for you. Personally, I will take the Spectrum any day of the week. GO AGGIES!